Or browse the digital flipbook to your heart’s content right here. Payment is also accepted in Bitcoin, Litecoin, Dogecoin. Look for the crypto option in Payment Method, after the Shipping Details. Buy multiple copies to share with friends and save massively! The wisdom stream that we know as Sacred Geometry is broad and deep. It is a key to good science, a secret of great art, and a light on the mystical path. The higher dimensional patterns and principles revealed in the triangles, hexagons and circles of the Flower of Life naturally attract the human mind and spirit back to their source and facilitate the evolution of consciousness. This book presents a synthesis of ideas from many of the most brilliant and inspired minds of our history, and shows how the ancient tradition of sacred geometry is as relevant as ever to the latest developments in society and technology. It covers an amazingly wide range of topics, from the simplest patterns, to the subtlest complexities of space and time, body and mind. It can quickly bring you up to speed with the essential fundamental forms and primary principles, and intrigue you with glimpses into the harmonic patterns that appear at every level of existence from the subatomic to the supergalactic. 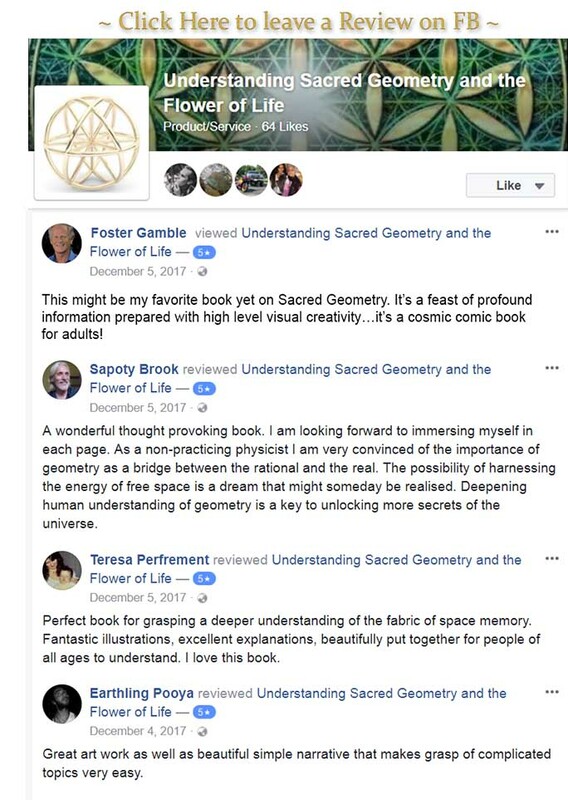 Understanding Sacred Geometry and the Flower of Life is a lavishly illustrated book about the beauty that is present within all levels of manifestation. It can be enjoyed by those with a passion for science and mathematics, as well as those of a more artistic and intuitive persuasion. All that is required is an interest in understanding more about the infinite mystery that surrounds us. The insights and principles of sacred geometry apply to every aspect of life. They help us to connect the dots and see the ‘big picture’ to find our harmonious relationship with the entirety of everything. What subjects does this book cover? 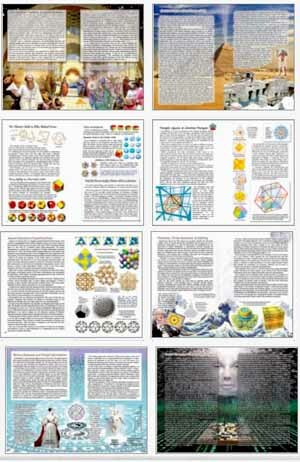 The sections of this book explore an amazing range of knowledge in relationship to sacred geometry. For those who feel like a description rather than browsing the book itself using the link above… here is a quick distillation of the topics explored. (But seriously … this quick summation is no substitute for browsing the online flip book version above with all its amazing illustrations)! We begin with a rambling cosmic introduction, and then go to the philosophers of ancient Greece, and the even older traditions of ancient Egypt. We then cover the importance of simplicity and its relationship to the circle, and the widespread use of the hexagonal patterns like the ‘Flower of Life‘, that circles naturally create. We learn of Buckminster Fuller‘s important work regarding the triangular/hexagonal forms, and learn two extremely important new terms from him, the ‘Vector Equilibrium‘ and the ‘Isotropic Vector Matrix‘. Then we move on to the ‘Platonic’ 3D forms and how they relate to the grid of matter and space. We learn of other important patterns such as Metatron’s Cube, the Golden Ratio, and the Electromagnetic Torus. We touch on the ubiquitous phenomena of spin, relativity, and relationships. We look at the geometry of the Earth, and the tribal peoples understanding of her patterns, before moving on to the importance of patterns and dimensional perception in the visual arts. There follows an extensive examination of the concept of dimensions and the history of the development of higher dimensional geometry. From this basis we can explore the core symmetries of spacetime and some surprising and significant anomalies in higher dimensional geometry. We look at 3D printed projections of some of these forms, and consider the way crystals relate to these same patterns. We consider how the infinite complexity and scale independence of fractals is created by simple repetitive processes. This brings us to some cutting edge physics, a model of subatomic spacetime based on the same flower of life related symmetries we have been exploring macroscopically. We consider the way harmonics and resonance can bridge the vast differences in size in the universe, and how the laws of music are the laws of creation. This knowledge opens the door to more harmonious forms of technology and energy generation than those we currently use. We touch on the importance of memory, and remembering the history of the suppression of this knowledge. To complete our journey we focus on the societal, biological, and personal ramifications of the sacred geometrical nature of reality. For instance its relevance to processing information, computing, artificial intelligence, and reformation of the outdated global economic system. We look at sacred geometries relevance to patterns of cause and effect in our lives, and to spiritual practices such as meditation. Finally we look at a remarkable ancient geometric construction and the mysticism surrounding it, before closing the circle of our explorations with some visions of how sacred geometry can assist in transitioning to a sustainable society. Many images used in the book’s artworks are original creations by the author, but some are sourced under ‘Creative Commons, Attribution Share-alike’ licensing. 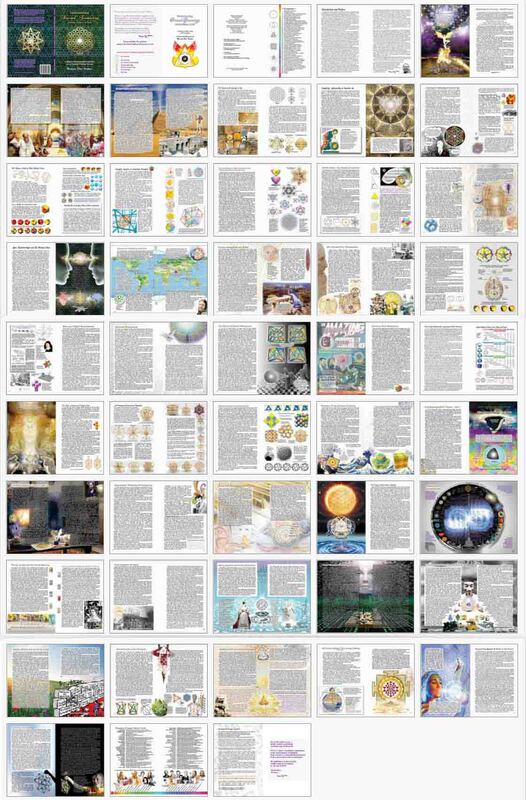 This page of image credits links to their Creative Commons source pages on Wikimedia Commons (or occasionally other sites). We will be creating in early 2018 an affiliate program calledSacred Geometry Game where you can earn rewards for helping to promote awareness of sacred geometry, (commissions on every book that you sell online through your customised link). We are also working on a links page where you can access all the third party information and tools that were mentioned in the book, as well as supplementary materials. If you like you can send me a message the the contact page here and optionally request to be notified when there is major news such as the affiliate program being implemented. Please remember to SHARE this page (use the icons below).